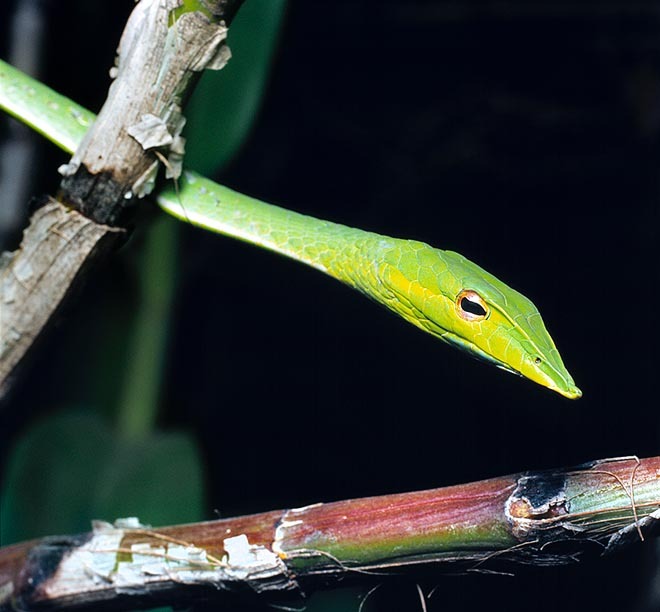 The Green vine snake or Asian short-nosed vine snake (Ahaetulla nasuta Bonnaterre, 1790) is an elegant and slender colubrid (Colubridae) called also Asian green vine snake or Long nosed vine snake, in German Nasen-Peitschennatter, in Bengali Laudoga, in Hindi Lata saanp, or Suapankhi, in Kannada Hasiru haavu, in Marathi Aranthol and in Tamil Pachchai paambu. It is typical of the forest habitat and of wooded and bushy areas, including parks, gardens and plantations. Its distribution range includes most of the Indian peninsula, including Sri Lanka, southern Rajasthan, part of the north-eastern provinces, Uttrakhand, Delhi, Himachal, whilst it is absent in the continental zones, north of the Ganges River, and in the basin of said river. It is present, also, in Bangladesh, Burma, Thailand, Vietnam and Cambodia. It is very common and diffused (in the western part of the Ghats it appears to be the colubrid present in the greatest number), so much to be found at low cost on many markets for terrariums lovers, but this is a delicate serpent and of difficult management, as it manly nourishes of geckoes, and which easily dies, in captivity, and for this reason it is not an animal to suggest to the lovers. 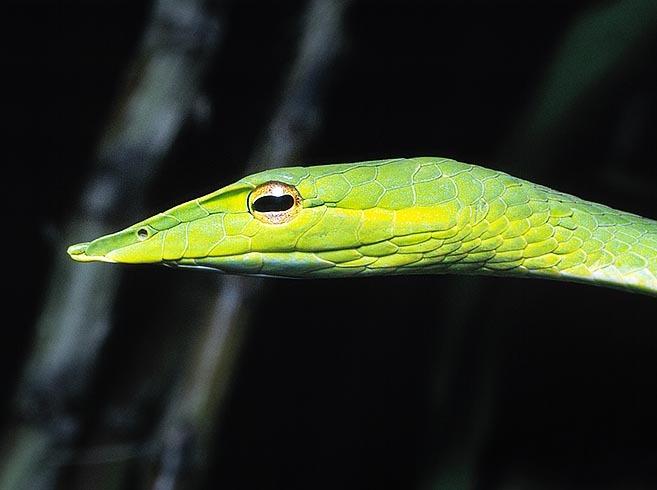 The Ahaetulla nasuta is a slender and graceful reptilian, of an average length around the 100-120 cm, but which can reach, in exceptional instances, almost the 2 metres (195 cm), with a transversally flattened body, thing which confers it the look of an elegant ribbon or of an eccentric belt, covered by smooth scales and of elongated shape, unsuitable for ensuring an efficacious traction on the ground, but which, on the barks of the branches, ensure an exceptional and sure grip allowing acrobatics almost challenging the force of gravity. On the branches, even the thinnest ones, it moves with the lightness of a feather, sliding on the foliage as it should be weightless, and passing smoothly from one tree to another, just if two branches have the complacency of being located at a distance which is less than the length of its body and this makes easier to the animal to get the food as well as to escape from enemies, apart some birds which are, actually, the main predators of this animal. colours, appear to be light blue. However, there are also specimens of brown or tawny colour, most common in the southern part of India (Maharashtra, Rajasthan, Gujarat) and others with a livery in brown and pink tones, which some recognize as a self standing subspecies (Ahaetulla nasutus isabellinus). The ventral parts are usually yellow and a stria, yellow too, borders the upper lip. The head is elongated and with a so much pointed snout of having generated a suggestive legend diffused in some zones of India, after which the Lata-saanp should keep in ambush on the low branches, at the height of a man’s face, ready to blind the passer-by with a sudden attack of its head, shaped like an arrowhead. Actually, even being a colubrid equipped with venom apparatus of opsthoglyphous type (fixed venom fangs and placed at the back of the mouth), it is not considered as dangerous for the man, due to the fact that, like all opisthoglyphes, it must “chew” on the prey in order to drip the venom into the wound, as well as the scarce quantity of venom secreted. Of diurnal habits, during the night it sleeps hidden among the foliage, in a ramification or, at times, in a cavity, which gives shelter and repair from the winged predators, whilst during the day it hunts, moving slowly, and getting close to the prey with small jerky advances, simulating the movements given to the branches by the wind and perfectly synchronizing with them, so much that even for a trained eye it is difficult to note it. However, it observes everything and evaluates well the distances because it’s one of the few serpents having a binocular vision. The shooting of the head, once gotten at the right distance, is instantaneous and the prey is held and killed by the venom, inoculated with almost masticatory movements, as the fangs are not hollow inside like those of the viperids (solenoglyphous) or of the elapids (proteroglyphous), but only slightly grooved. It often hunts simply in ambush, keeping motionless for hours, in strategic locations, where the passage of some lizards is more likely. Usual preys are various species of geckoes and other arboreal lizards, but at times also nestlings and small birds, rodents, arboreal batrachians (tree frogs), small snakes, also venomous, and, maybe, also insects, if the prey is scarce. In any case it is a very selective species, and this explains the difficulty in keeping it in good health in the terrariums, in spite of its easy availability, furthermore, it seems rather likely to get sick, at times of mycotic infections related to an habitat which is different from its own. The reproduction is of viviparous type. The mating season goes from early summer to the end of the monsoons and the female “gives birth” to the young (a score, as an average) on a branch, then lets them at their fate, seen that they are animals practically already self-sufficient a few hours after the birth. It seems that the females can conserve the sperm for long time after the mating in order to generate the young in the most auspicious moment, even 2-3 years after the coupling. Aethulla nasutus, Dryophis nasuta, Dryophis mycterizans, Coluber mycterizans, Dryinus oxyrhynchus, Dryinus russellianus, Dryophis hammatorhynchus, Dryinus fuscus.